This month, we begin in the Adirondacks, as Magdalene wakes up in the Adirondacks home where she's been on holiday for months. She calls out for the Swordsman, but finds he's gone. Swordsman is called back to the grotto of the previous issue, where Tuc and a bald stranger ask Swordsman to tell the Avengers "who mourns for Agaphaur?" Why is this one panel broken into five pieces? I feel like I need Scott McCloud on this one. 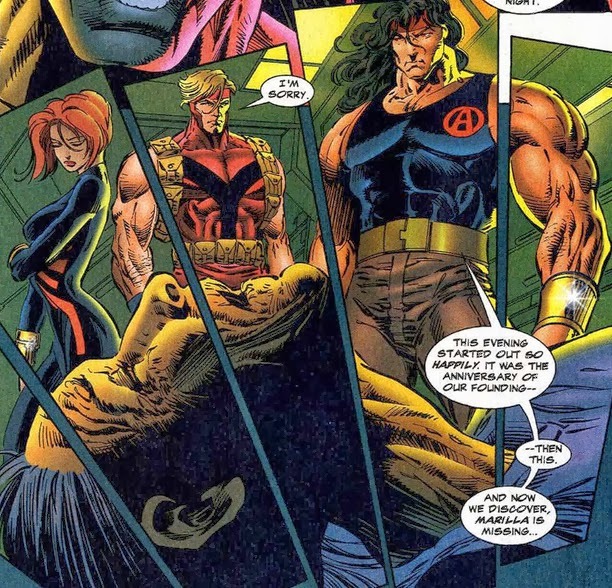 Back at Avengers Mansion, Hank Pym, Hercules and Black Widow see to fan-favorite (not really) Gilgamesh, who is apparently suffering from severe cellular deterioration. 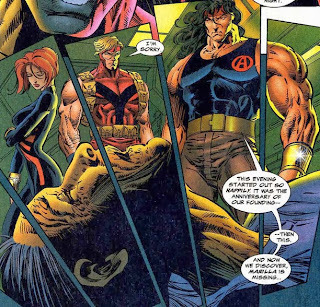 Herk points out that Gilgamesh is an "Eternal," which would seem to imply immortality, but Hank Pym doubts the man will live through the night. Elsewhere in the mansion, Crystal, Luna and Deathcry worry about Marilla being missing, when Vision rises up through the floor and says to assemble the team. Across town, Janet Van Dyne's attorney has followed the paper trail to discover the cause of her economic misfortune. Janet shouts "Why would he do this to me?" without revealing who exactly she's talking about. Vision gathers the group and Hank Pym confirms that Vision found molecular traces of Marilla, confirming that Marilla was blasted by an energy source. 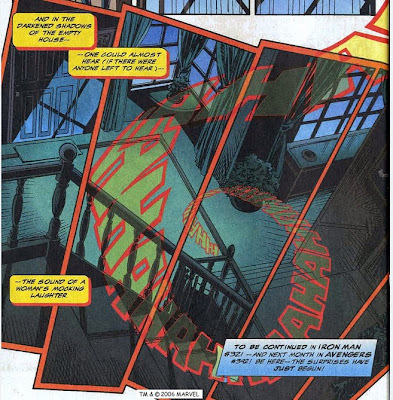 The team mourns, as Jarvis is too upset to even brew some tea, when Hank Pym comes back from the lab revealing that the sensors found evidence of a second murder, fan favorite (again, not in reality) Yellowjacket, aka Rita DeMara. The team barely has time to react to this when they hear Gilgamesh screaming. Quicksilver takes off to find a blue guy with a big head stabbing Gilgamesh in the chest with some sort of lance. 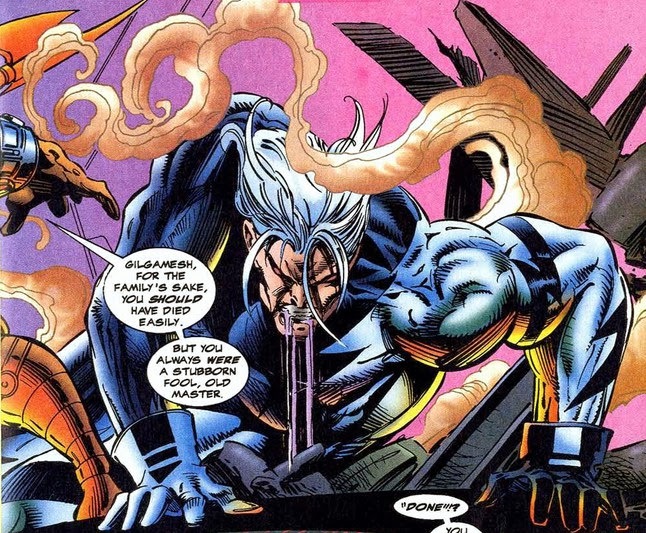 Neut, the big-headed blue guy, blasts Quicksilver, then dodges the other Avengers, bragging that he "did not serve his lord and lady this long to be brought down by the likes of (the Avengers)." Why did he emphasize the word "this" in that sentence? Who knows? 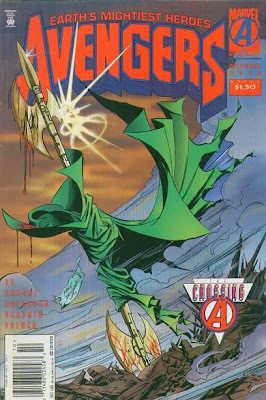 Crystal checks on Gilgamesh, and plans to use her air powers to try to help him, but he says it's too late for him, and warns the Avengers that "she" hates them and loves power, and that they're all in danger. Neut celebrates momentarily, then cuts a hole in the floor and drops to the basement. He confronts Vision and calls him an "Abomination" and a "sepulchral android," implying that whoever his boss is has a particular grudge against Vision and Scarlet Witch, whether or not they're married. Neut disappears back behind the door, and Vision lamely says he can't get through the barrier. The assembled team calls Tony Stark and tell them that they're evacuating the mansion until they figure out what's going on. Luna says "bad man" and Crystal for some reason doesn't get that she's referring to Tony Stark. As Black Widow locks up, narrative text tells us we could almost hear (if anyone was there to hear it) the sound of a woman's mocking laughter. As you might notice from this review, not a lot happens this issue. The team learns of Marilla's death, mourn for a bit, then finds out somebody else got murdered, then get beaten up by a tiny blue man named "Neut." It's not exactly a landmark day for Earth's Mightiest Heroes. I don't need wall-to-wall action, but so much of this is just sort of treading water. There isn't any new information here; this is just a "next day" follow-up to the Crossing that just doesn't accomplish a lot. The book also doesn't seem to be clear on whether we should know what happened in The Crossing. It hints heavily at Stark and some mystery woman being "bad guys," but we don't get Wasp's reaction that Tony Stark is behind her financial set-backs. Why? It's not a mystery that Stark's behind it. We already saw him murder two people! There's no suspense in her "not him?" response. It's Stark. I would blame unclear editorial for not making clear what the audience already knows, but this is the exact same creative team from the Crossing. How do you not know this? I hope the villain is revealed to be a g-g-g-ghost. 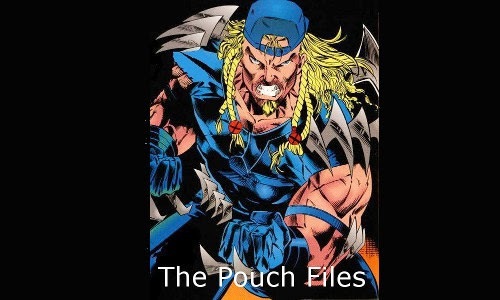 Marks Remarks: Mark Gruenwald, the EIC of the "Marvel Classic" brand, includes a Stan Lee's soapbox where he comes off as apologetic as he responds to (apparently) angry fan mail. He points out that Marvel is publishing less books overall than they were a year ago (I'm not sure if that's including the re-launch of Malibu books), and further, that many of them are priced $1.50, especially among the books he edits. The apologetic tone seems to indicate that Marvel's already floundering a bit by this point in the 5 EIC experiment.